Back in 2007, author and entrepreneur Don Sevcik had a bold idea. Why not give parents and students a place to get math help instantly? What if you could enter a math problem, push a button, and see all the step by step work instantly? So Don created a place where parents and students never have to schedule times with tutors. A place where weather, scheduling conflicts, and traffic never interfere with a child’s education. After a hard day, Mom relaxes knowing her child gets detailed math help. Dad gets peace of mind. How? Because his child never struggles with math ever again. And, Mom and Dad do not have to hand over astronomical amounts of money to get this help. There are no pages to turn. No clunky lesson plans to sift through. Instead, it’s a rectangular box. This box is always waiting for your questions. And when you ask your questions, you get an answer back immediately. Your answer has detail, explanation, and clarity. What if Mom wants to work with her child side by side in math? The little search box gives Mom all the math work she needs instantly to help her child. Mom doesn’t have to go read through giant math books anymore. At the tip of her fingers lies everything she needs to be a hero to her child in math. When Dad gets home from work, he is secure in knowing any math questions his child has are a click away. Q: How does this all work? How does a computer understand and solve math problems with vivid detail? A: It’s built on our S.M.A.R.T. technology. Each day, the program gets smarter. It’s been this way since July 2007. People from over 30 countries, from all walks of life, supplying math problems on a daily basis. How does this help you? Easy. Blink your eyes one time. Science tells us the time it took for your eyelids to open and shut is 1/3 of one second. Not by coincidence, this is the average time it takes for our search box to run your math problem and display the step-by-step work on the screen in front of you. Yes, you read that correctly. Because the only thing better than completing and understanding your math homework is doing it faster than you ever have before. Who doesn’t love saving time? While reading the last few sentences you might have blinked again. In that time, we solved another math problem for somebody. More importantly, this person understood the math problem. This is our promise to you. Every time you blink, we will solve and explain another math problem for you. Math is challenging. If math gives you a headache, let MathCelebrity be your aspirin. 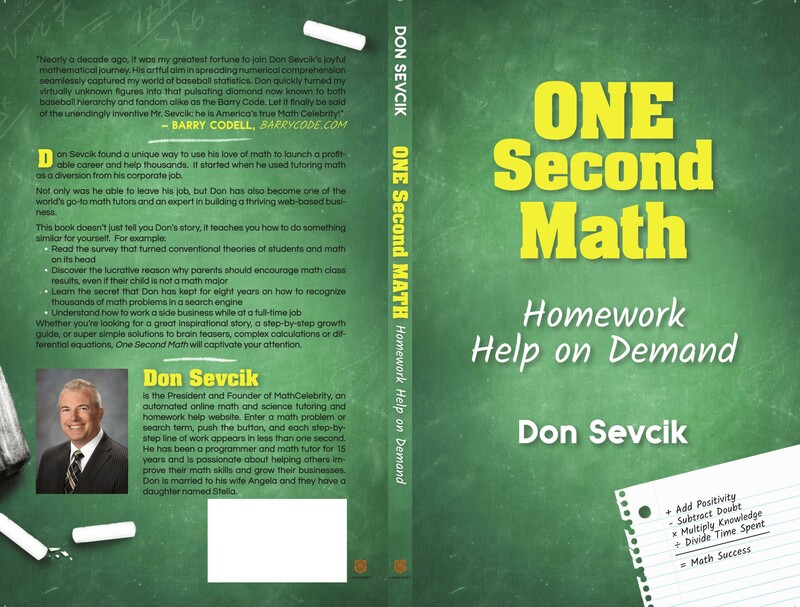 Listen to "Don Sevcik - Author of One Second Math Discusses His Book and MathCelebrity.com with Mark Imperial" on Spreaker. 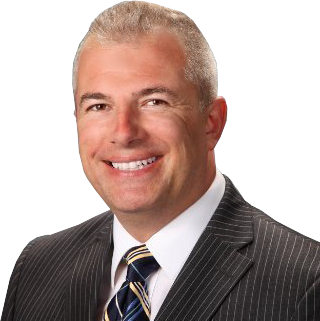 Mark Imperial: My next guest is here to discuss his recent book release, One Second Math: Homework Help on Demand. He is an author, entrepreneur and business automation expert. He created the wildly successful math tutoring website, www.mathcelebrity.com. The website gets over 300,000 monthly visitors in 30 different countries around the world. Please welcome to the show, President and Founder of MathCelebrity, Don Sevcik. Don Sevcik: Thanks Mark, great to be here. MI: Before we dive in, who should read this book? Parents who want to learn more about how we built the website and how we help students Entrepreneurs interested in learning real world applications for building a business, particularly in automating your business in ways you never thought possible. MI: Tell us about the book, Why did you write it? DS: People we meet through the website asked us how we got started, how we built the website, and what our story was. I figured it was time to put my story on paper, instead of keeping a perception of some robot website that solves math problems. It gives the human side of my story, and puts a face and a personality behind the website. While many people know the website, they don’t know the person behind it, how it was started, and what makes the website tick. I’ve been asked many times about many of the topics I cover in the book, so I figured I’d put it all on paper. I’m turning our focus more towards parents, so I want them to know who built the website, why I built the website and who they are buying from. Because in this day and age, people buy people more than people buy products. The second reason for writing the book was empathy towards entrepreneurs. The things you go through, what it takes to start and maintain a profitable business, and how to juggle this with a day job. Part 1 is my story, my motivation, and the building of the business. It’s everything behind what it took over the last 9 years to build a website that solves problems automatically. The highs, the lows, and things I learned. Part 2 is a math book, full of shortcuts, tips, and tricks. I made sure the math book got right to the point, fluff free. The math covered in the second half of the book is extensive. In theory, a kid could buy this book in second grade, and use the concepts and notes all the way through college. MI: Describe for me, the significance of the book title, One Second Math. How did you come up with this title? DS: In the introduction of the book, I talk about the blinking of the human eye. Now when you blink, from the time it takes for your eyelids to open and shut is approximately ⅓ of one second. Now here is where it gets interesting: that is the exact time it takes on our website to run a math problem and display on the screen in front of you, the exact, step-by-step math work for a student. I rounded the time up to a full second, because people understand whole numbers, and the phrase One Second Math stuck, because it is exactly what MathCelebrity does. It solves your problems in less than one second. I take pride in our speed. Students are very busy these days, so the more time you save them, the more valuable you position yourself. There is an ancillary meaning behind the title as well. It’s a nod to working parents, who have hectic schedules and children with many activities. Think of it as a wink, since I am also a parent. This wink signifies, I understand you, I know what you are going through, and I am here to help. I hear parents wishing for more hours in a day, and some of those hours are spent with their children trying to make sense of and finish math homework. One Second Math is a vision for the future, where parents can let their kids use the website, and answer questions when needed. It frees up parent’s time as well as relieving stress. Part of this grand vision is Mom relaxing after a long day, Dad taking a hard-earned break, and during this time, their children learn and complete their homework in record time. This is my vision for the future. In the book, I talk about the doorway to the heart of a parent is through their watch. Specifically, to rewind the hour and minute hands on their watch by giving them more time throughout the day. This is the MathCelebrity website specialty. Giving parent’s time back while simultaneously helping their kids learn better and faster. Want to make Mom smile? Give her back 60 minutes in her day. You want to wow Dad? Have his child get good grades in math without forking over astronomical amounts of money and time. MI: For our listeners who don’t know about MathCelebrity, tell us a bit about the website. DS: MathCelebrity is an automated online math tutor. Think of it as a Google for Math. You enter your math problem or search term, push the button, and every step-by-step work appears instantly. Just like the beginning of the interview, you blink, and by the time your eyelid opens and shuts, the math work is there for you on the screen. And the work behind the answer is organized in such a way where anybody can follow it and understand it. We cover second grade all the way through college. We are a supplement to the curriculum you see in schools. If you’ve ever seen the Staples Easy Button commercials, where you push the button and your problems get solved, that is us, with math. Think of us as a digital tutor. We have no constraints on business hours, no need to drive and schedule a tutoring session, and no sessions will be cancelled due to inclement weather. We are just like Google, in that the little search box is always there, ready to help you when you need it. MI: In the early chapters, you talk about the spark for the idea behind the website, tell us more about that. DS: In 2007, I worked in a boring tech job. The book opens in one of those mundane meetings typical in a corporate setting. I grew tired of the corporate process and the lack of a meritocracy. In the book, I call it “chasing the carrot” where a boss dangles a carrot in front of you as your raise. You chase and chase, but you never quite get there. The marker is always moved, just out of your reach. Anyway, to branch out and earn more money, I started math tutoring on the side. 1 client grew into 2, 2 grew into 4, and it expanded from there. I ran out of hours in the day to serve anybody else. I did not want to give it up, but I also couldn’t abandon my day job at the time. This part of the book explains how I turned frustration into motivation. I think this part of the book will resonate well with a target audience. This audience contains anybody who works a corporate job and they find themselves frustrated with the review process. At the same time, this person dreams of starting their own business where they are rewarded based on merit. I call it the alternate universe. And in this universe, you are free from corporate politics and silly annual reviews. The money you earn is yours, and you are limitless in how much you can earn. The other piece is motivation through a mission. At many day jobs, you find yourself doing busy work, or doing work which really doesn’t lead to helping the cause. You are a number, in a mechanical position. At times, it’s demoralizing and demotivational. On the other hand, when you find something you truly love doing on the side without a corporate structure, something magical happens. At the risk of sounding cheesy, it’s a spiritual awakening. You feel a profound difference from wasting away sitting in a cube farm. To hear a parent tell you their kids got better grades in less time makes your day. To hear Mom and Dad tell you they saved 4 hours or more a week for math homework is life changing. A few of these emails and phone calls was all it took to understand my role. It’s a feeling, which is tough to quantify at first. As I started building the website in mid 2007, I felt it. It was hard to explain at first, but it was there. You can’t touch it, taste it, or smell it, but it’s there all the time. Almost like a slow, constant rumble. It got louder the rest of the year when I first started the website. It’s almost like the universe screaming at you, telling you to do what you are supposed to be doing, and stop wasting time on other busy work. The first time I really understood what I felt was August 2007. I plugged away for 10 hours in my basement on a day off. And 10 hours went by like 10 minutes. I wasn’t tired, I wasn’t bored, I wasn’t distracted. My goal was clear. It never felt like work. It was fun. Not easy, but fun. And mind you, this feeling preceded any feedback parents ever gave me. Once parental feedback came in, I felt bulletproof. All bets were off. I knew after that 10 hour day in 2007 what I had to do. Build this website up to be the fastest and most efficient math tutor, and take it as far as I possibly could. MI: How difficult was it to build a website that solves math problems? Were you always a programmer, did this come naturally, or did you learn as you go? DS: Well the good news is, I had programming experience prior to starting MathCelebrity. The bad news...I had zero experience in building websites. This was my first challenge. I walk through this learning process in the early chapters. I hired a friend to teach me some basics in web programming. Once I got the basics down, I started with one simple lesson: adding two numbers together. I remember back in 2007, I spent near an entire day working on this. When I first got the lesson to finally work, it felt like winning the Olympics. To push a button and watch all the math work appear on the page instantly gave me a rush. This was the first time I saw my dream of math tutoring without having to be there be quantified on a computer screen. Now, I’d be able to scale and be millions of places at once. I could help people in other countries far away who I would probably never meet in person. The dream turned into excitement, and the excitement turned into momentum. I took this momentum and started to build more basic math calculators. Once I finished those, I went through math books in my basement and attempted more difficult math, such as algebra, statistics, and calculus. MI: Talk about the growth and evolution of the website. Did it take off or was growth more gradual? DS: For the first 18 months, visitors trickled in. I think after 18 months or so, we consistently averaged 20-30 people on the website per day. Nothing to write home about, but it was positive momentum. I’m a big believer in Kaizen, small, constant improvements each and every day. Even if it’s 1% per day, it adds up. As small gains continued, 4 years after the 2007 debut, we had some days where we got 1,000 people a day. 2013 and 2014 began our climb from slow linear growth to more of an exponential gain. Coincidentally, it was around this time where I had the biggest breakthrough on the website imaginable. I learned the ability to recognize math problems entered directly. You see, before this time, people had to enter a search term, such as equation, or division. They’d scroll through the search results, pick their calculator, and then enter their problem. This became inefficient, and once people entered problems directly, we made a difficult, yet massive transformation. Once we added pattern recognition, we made our turning point from a decent website to a major player in the educational technology space. And this year, just last month, we cracked 300,000 visitors in a month, and we are growing at a 10% clip each month. It all started with the ticketing system. Over the years, I created a ticket report. And what this report does is sit in the background, and monitor search activity on my website. Think of this ticket system as an employee who never sleeps, they are always watching and learning. Now, when somebody runs a search term or problem the website does not recognize, this ticket system notifies me on a private report. Every morning, I review this report and build the missing search terms. This strategy worked well for years. However, one morning, I glanced at the ticket report and noticed somebody ran an actual problem, not a search term. The first problem I saw was 2x – 9 = 31. The next day, I saw more operation problems, such as 95 + 21. I still remember this day like yesterday. My jaw dropped, I knew this was our chance to go from good to something special. However, I never worked with or read about pattern recognition. I remember asking myself, is this possible? How much work is involved? Is this level of difficulty over my head. I turned to one of my personality flaws, which is stubbornness, and used it to my advantage. I like to think of automation as the intersection of laziness and stubbornness. Anyway, I plowed ahead and researched for 2 days straight, and I eventually found my answer by studying language patterns and linguistics. MI: Once you discovered language patterns, how were you able to use this to handle math problems on the search engine? DS: I had my first big breakthrough shortly after my research session. I scampered down to my basement, and I started listing out basic math problems. Take adding two numbers, subtracting two numbers, etc. To drill this into my head, I listed out 25 problems on a piece of paper and just stared at it. I locked the doors, turned off my phone, turned off my computer, and just stared at the paper. After 5 minutes, it hit me. How? Well there is a great example related to this in the book, On Intelligence. It summarizes automatic pattern recognition beautifully. Imagine you are in your car driving down the road, and your attention is suddenly diverted somewhere other than right in front of you. For whatever reason, you are momentarily distracted and not paying attention to the road. Now as you drive, you notice out of the corner of your eye, a faint red octagon shape with blurry white lettering in the middle. It’s getting closer and closer out of the corner of your eye. Your foot instinctively presses on the brake pedal. Why did you do that? You aren’t looking at the road nor the sign. It was an unconscious move, so why did it happen? The On Intelligence book explains this beautifully. You see, your brain stored the image, shape, and layout of the stop sign from previous driving sessions. It also associated this sign with the side of the road and you being in your car. So your mind stored this event and recalled it while you were driving. To summarize, your brain relates the road to the red octagon pattern to white lettering in the middle sitting at the side of the road near an intersection. Even if the details are not crystal clear, all the basic signs are there. In addition, the stop sign pattern does not change. The pattern is the same now as it was 40 years ago. It does not change. Now here comes the best part, neither do the patterns of math problems. They share unique traits which you can pick up and identify. I want you to think about a 2 number math operation: It’s a number, a sign (plus, minus, star for multiplication) and then another number. The beauty of this is, the numbers can be any positive number. And the operation signs are limited to just 4. This represented my first breakthrough to automate the solving of math problems. Once I made this connection, I was able to build basic pattern matching. MI: Fascinating!. After figuring out patterns, did the website take off? DS: Yes, this transformed our website and signified the quantum leap, both in traffic, and coverage of math problems. There was a distinct feeling I remember, it’s almost unexplainable. When I got the first pattern to work I called a friend to test it on the website. When it worked for them, I got out of my chair, ran around my house, and went crazy. There are certain moments in your business, where you make large leaps. This was our biggest leap by far. I can look back to this point in time where traffic exploded, our mentions grew, and people started taking us seriously. This math problem pattern change made the user experience simple. Everybody understands Google for example. A little rectangular search box, and the search box gets you everything you need. With the pattern recognition change, our search box became our goldmine. Users loved it, it required no thinking because it removed barriers. There was no stuffy professor pontificating about math theory. There was no tutor who was half asleep when you needed them most. With MathCelebrity, you get a small rectangular search box. Simply ask the search box, and we will give you everything we know in the blink of an eye. Notice I said simply, as in simplify. The best businesses we know today simplify things. Apple’s iPhone Home button, Google’s search box, NetFlix easy ordering of video, Amazon’s upsell process. They make the incredibly difficult look easy. MI: As you built out the website, did you run into any challenges? DS: One massive challenge I ran into during the pattern recognition building is understanding the different search requests people entered for their problems. Around this time, there were thousands. Some days, it felt like I was drowning. Sometimes, it felt overwhelming. Even though I built pattern recognition every day, sometimes, for 10 plus hours, I felt I did not make significant headway during the first few months. It almost felt the same as taking 2 steps forward, then 3 steps back. Eventually, I ran out of gas. I needed a break. So my family and I packed up and went to Phoenix for a vacation. Little did I know this vacation would give me another breakthrough. Life has a way of showing you irony, giving you answers in places you never think to look. One of the days during vacation, we took a trip up North of Phoenix to a little town called Sedona. While hiking through the mountains, I found the answer to my pattern recognition problem in the red rock formations and trees of Sedona. I wasn’t even looking for it, but on the trail, it came to me. Mother Nature taught me about Human Nature. What I found in the rock formations and trees, I talk more about in the book. But the concept helped me make the breakthrough I needed. MI: We are discussing programming, which is one of the subjects you cover in the book. Some of the chapters cover pattern recognition and artificial intelligence. How will the average reader understand this? DS: One of important things while writing this book was simplicity for the reader. I wrote the book for people who know little to nothing about programming. It’s written in a way where anybody can understand it. I relate the programming to a restaurant hostess, waiter, and serving station. I also talk about programming in terms of seashells and tree branches. This part of the book was crucial to explain my story to non-programmers. To get this right, I had two non-programmers read the book. The goal was to get them to read through the book without stopping or getting stumped. If they did, I rewrote that part and had them try again. The non-programmers came away from the book understanding how I do what I do at a non-technical level. No matter if you are a working parent, somebody just starting in programming, or somebody who wants to learn how code turns human language into a search, this book explains it in simple terms. The number one goal with this book, especially the technical part behind the website, was crystal clear clarity. I want an 8th grader to read this and understand it on the first try. I think this book speaks to anybody who has a website. I talk about the changes we made, things that worked, and things that did not. I turn the technical concepts into everyday things in life people from all walks of life will understand. MI: In the book, you talk how people could not believe the concept of a search box answering math problems. How did you manage that? DS: When we met people at conferences, it took a minute for them to process. They would ask, is there somebody on the other end of this website answering these problems? We’d laugh, and tell them a robot is solving it. An algorithm. And this algorithm gets smarter and stronger every day. Now for people who don’t know this term, an algorithm is basically a glorified word for a logical process. The simplest version of an algorithm is a recipe. Think of a cake. Take 3 eggs, mix 2 cups of flour, add 2 cups of milk, bake at 350 degrees for 30 minutes. Well MathCelebrity does the exact same thing behind the scenes. We identify what type of problem you want, and then direct you to the correct place which solves those problems. The second part of this process is building trust. One great story comes to mind about trust: Fire, Water, and Trust are walking along in the forest. One of them says, what happens if we get lost, how will we find each other? Fire says, Just look for the smoke, and you’ll know where to find me. Water says, just look for the green grass and flowers, you’ll know where to find me. Trust says, You better not lose me, because if you do, you’ll never find me again. This concept stuck with me over the years. In the digital world, we have mere seconds to establish trust and credibility. When a person lands on our website for the first time and runs a problem, I want to make sure it runs quickly, with easy to follow detail. This is the handshake to the beginning of our relationship. If the website gets this wrong in any way, I can kiss any possibility of a future relationship goodbye. The first problem, or search, is crucial. As they run more problems and more searches, we gain a relationship. Because I’m not looking for a one-time visit. I’m looking for parents with kids who need help for the next few years. I’m talking about being their math tutor from diapers to diplomas. We met some people at conferences who said, “I could see my kids using this for the next 6 years.” This is how I want to build relationships. It's no different than the reliable plumber you call when you have a leak. It’s no different that the dentist who always gets your teeth perfect for the last 30 years. I want to be the math tutor you choose without even thinking. And to do this, I have to make the search box the go to place for math tutoring. It has to be easy, it has to be right, and it has to be fast. The parents who get us, and get the concept realize how we will be the learning supplement for their kids for years. No matter what subject or concept they need help with, all roads lead back to the search box. We want to be for math what Google is for regular searches. Reliable and quick. No matter what kind of tough times you experience with math, I want students and parents to take comfort knowing our search box is there. If math gives you a headache, I want MathCelebrity to be your aspirin. MI: The book talks about personalizing relationships more. One of the things you did was build a forum. How does the forum work with the website? DS: A forum fosters a sense of belonging. The search engine is great, but it’s robotic. And sometimes, people have questions above and beyond the search engine. I’m talking about long form word problems. I created the forum so people could post these problems, generate a discussion, and see me active in there answering questions. The forum also shows other questions which people ask. Unlike the website where Jane Doe cannot see what John Doe is doing, the forum shows questions asked publicly. Other people get to see various struggles in math from other people. And Human Nature dictates curiosity, as in, what are other people doing. What are other people talking about or asking about. The forum accomplishes all of these tasks. MI: Staying on the topic of personalization, you talk about the homework mastermind group. Tell us more about that. DS: As we’ve built up the website and established relationships, I’ve learned certain people need reassurance. I’m talking about reassurance above and beyond the reassurance and tutoring they receive from our website. Sometimes, people need a guide, a coach if you will. This led to the creation of the homework mastermind. Masterminds of course, go back to the days of Napoleon Hill, from the Think & Grow Rich book. There is power in numbers. So I structured the Mastermind and limited it to a small group. What you get with the Mastermind is access to me any time. If you need help with homework, struggling with concepts, you can call, text, or Skype me. And I will get it worked out. I just introduced this service recently, and I think it’s important for people who really need help and reassurance. Consider it a mathematical guardian angel, somebody who watches over you and is there when you need math help. I believe mentors are important, from the time you are in school, to the workforce and beyond. Learning is accelerated through masterminds, and what’s not to love about that? MI: You go into detail in the book about the job market, and present an interesting point about the importance of math, even if you aren’t a math major. How do you see math relating to the real world? DS: First let’s ask, what is Math? Math is problem solving. And no matter what field you choose, finance, technology, art, literature, problem solving is universal. People are surprised when I tell them the fields math is utilized in. Actuarial science, sports statistics, stock market, video game development, online shopping. I’ve given speeches at a few schools, and kids are shocked to learn about math and vectors being used for XBox Live. As soon as you tell them about math in videogames, they perk right up. And just when they think they’ve heard it all, you tell them that Google’s incorrect spelling search uses math. So does Amazon’s upsell function. You know the one: customers who bought x also bought y. When you incorporate these kind of events and explain the math behind them, then the kids, and even some parents get interested. In the real world, more importantly than math is the benefit of problem solving, especially speed. I emphasize learning speed because deadlines don’t move. Clients want work by a certain time. With respect to entrepreneurship, the Market moves faster each year. Many companies release what is called a Minimum Viable Product. If it sells and gains interest, the company improves it and goes to the next problem to solve to make the product better. MI: Speaking of math, a big conversation going on in America right now is Common Core. Do you address this on your website, and in One Second Math? DS: Yes. We cover Common Core on the website. A few years back, parents requested this. Parents across the country have universally banded together and formed a united front against Common Core. The website shows both the traditional and Common Core method to solve a problem, if one exists. Regarding Common Core in general, I talk about this in the book. It’s one of the most polarizing subjects in the last few decades. I rank it up there with politics and religion on the conversational polarity scale. Now here is my personal stance: so long as a kid solves a problem correctly, who cares what method they used to get there? In the real world where we have bosses, clients, and deadlines, what matters getting the job done. More importantly, getting a high quality job done on time. Different people think different ways, and this is the problem with forcing kids to use Common Core. Problem solving is a journey, there isn’t a unique path. I don’t know where future legislation and politics will lead, but I do know we should not force a certain problem solving method on anybody. Einstein’s quote comes to mind: "Everybody is a Genius. But If You Judge a Fish by Its Ability to Climb a Tree, It Will Live Its Whole Life Believing that It is Stupid"
MI: Let’s switch gears for a moment, and discuss new features. I noticed you also offer exam certifications. That is far different from math, can you tell us how that came about? DS: A few years back, I needed to get certified for my day job in Google Analytics. Coincidentally around this time, a parent of a student mentioned they were getting certified for marketing. I took the test, passed it, and had a collection of notes. I saw online how many people were looking for help. Even though it has nothing to do with math, it’s learning, so I got an idea. Why not add these certifications to the MathCelebrity website? I added the first exam, submitted it to Google. Within 24 hours, I had 5 leads and 3 customers. Then they started asking for more exams. I added 2 more, and the party really started. People asked for more exams. Soon after, I added a feature which differentiated us from any other study program…Instant search. As you type your question or answer, the list filters immediately. This saves you 5-7 seconds per question, which really adds up. It removes frustration and gets you what you need instantly. Another benefit I added to differentiate was the source link for an answer. This acted like a dynamic study guide. After people pass the exam, they like to read into the concepts more. The source links show them exactly how we found the correct answer, thereby cutting down their study time significantly. It also respects our principle of speed. We live in the age of right now with no patience. Fans responded positively, so we continued to add more exams. I’ve thought about how exams certifications are not math, so down the road, we may split this service off into a separate website and brand. I think this makes the most sense. Right now, I have it on the MathCelebrity website under the MathCelebrity brand. MI: What were some of the challenges in building the website? The book speaks to entrepreneurs, so what message can you deliver to aspiring entrepreneurs who are looking to start or just started a business? DS: Manage your time, find what works, and do more of it. Find what doesn’t work, and if it can’t be improved or does not show a return on investment, don’t beat yourself up. Discard it and move on. One of the hardest things to correct in human nature is admitting you are wrong. This is step 1. Step 2 is focus on what grows your business. Too often, startup businesses and small businesses get too involved in the minutia and day to day and ignore strategy. The opposite should occur. Once a week, go somewhere and give yourself time to think. How will you get customers? What is the endgame of your business? Do you want to just make income? Are you looking to attract investors? Do you want to package it up to sell it off someday? These are important questions any business owner needs to ask themselves. I find when you ask yourself these tough questions, it helps you focus and grow. The other piece which helps is automation. I try to automate everything possible. It not only saves you time, but it removes hassle. I specialize in automating things people do not think about. Then, when you get all the pieces together, you are able to automate relational parts in your business as well. As an example: Acquire a lead via automation. Nurture this lead using automated email, texts, and social media posts and chat messaging. Take the customer from nurture to a sale, via full automation. After the initial sale, set up a process for upsells, or future sales. Post sale, automate the testimonial and customer generated content process. Automate the posting of these testimonials to social media and your network. Finally, automate the nurturing and closing of the referral process to get a new lead. Which starts at the top once again. MI: How are things going now? DS: We just passed 300,000 monthly visitors last month. I want to grow to 500,000 by May 2017. People stay on the website longer, we add more material every day. We are breaking all of our traffic records, daily, weekly, monthly, and annually. We have strong market share on Google. I’m trying to build the website to solve as many math problems as humanly possible. In one of the chapters in the book, I share many of my secrets on how to get free traffic without spending a dime on Google. I find many business owners desperately want more traffic. I know the secrets I give away in the book will help them achieve this. For next steps, I may add courses. Math courses and programming courses. I’ve seen some interest from our fans on this. MI: To wrap up, where can people find you? I’m running a special offer from this interview: Buy the book, and I’ll give half off our premium monthly membership with proof of purchase for our math tutoring quiz generators, practice problem generators, or flashcards. I’ll also give a free consultation to anybody interested in learning more about our coaching group for math tutoring and our coaching group for entrepreneurs. This book doesn’t just tell you Don’s story, it teaches you how to do something similar for yourself. Whether you’re looking for a great inspirational story, a step-by-step growth guide, or super simple solutions to brain teasers, complex calculations or differential equations, One Second Math will captivate your attention.